1000 x Heavy Duty Shell And Slide Foam Lined Postal Boxes 7"x5"x2"
Home » Boxes » Shell & Slide Foam Lined Boxes » Shell & Slide Boxes 7"x5"x2" » 1000 x Heavy Duty Shell And Slide Foam Lined Postal Boxes 7"x5"x2"
1000 x shell and slide foam lined & insulated postal boxes, size 7x5x2" (181x120x49mm). These are premium quality UK manufactured boxes, designed to give the highest presentational feel to the package while ensuring excellent protection in transit. These high quality boxes are manufactured to the highest standards, with 20mm thick internal foam lining. 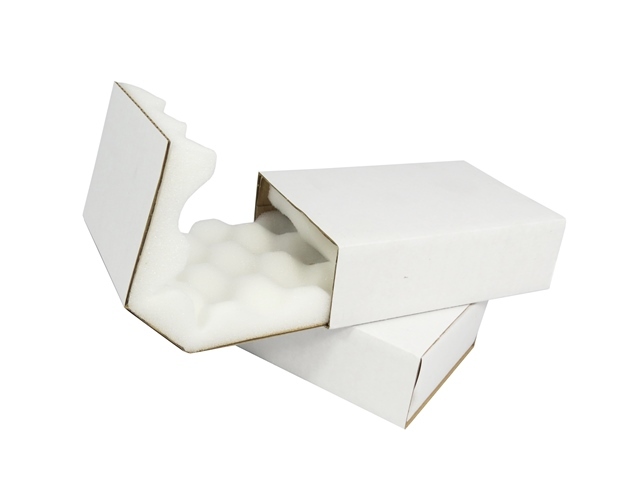 The internally foam lined box simply slides out for you to insert your product nice and easily, and then slides back in ready for you to send the box in transit, via royal mail or courier. The thick foam lining prevents damage occurring to the item in transit. Made from heavy duty 150 WK/T board.